What I'm Watching: "Roger Ramjet"
One of the unexpected effects of the digital era is the blurred distinction between animation and live action. The technology required to produce digital animation is increasingly affordable and commonplace, and knowledge of its effects and how to create them are now in any filmmaker’s toolkit. As a consequence, more movies and television shows are augmented by digital animation of some kind. This is true even of seemingly “all-natural” recent films such as The Help and Moneyball (both 2011): Those films' credits list, respectively, 22 and 68 digital-effects artists and technicians. While we might not consider, say, digital color-correction artists to be animators per se, the distinction between such technicians and “proper” animators is fairly arbitrary. Both use digital tools to create moving images. But it was not always thus. Animation, still a highly labor-intensive practice, has come down tremendously in cost since the advent of digital tools. While the initial outlay for computers and software (and software development) can be large, a company can amortize those costs over several animated productions. Also, much of the animation occurs within the computers: preprogrammed algorithms, in which variables are simply altered, are now responsible for the bread and butter of many animated movies and shows. To get a sense of how this works, check out the fascinating video below, which is a clip from a recent SIGGRAPH presentation by the animators of Disney’s film Frozen. Most, if not all, current animated television shows use digital tools and techniques, precisely because their use has become so efficient and cost effective. But not that long ago, most television animation was hand drawn — a tremendously time-consuming and stressful process, particularly given the rigors of a weekly production schedule. 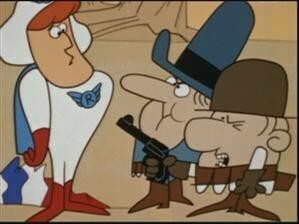 That’s why older television cartoons are so clunkily animated: Their makers took every shortcut possible. Some of them hark back to the first wave of cinematic animation, which presented animators with similar challenges. One shortcut is called “slash” animation, and you see it all the time in such shows as “The Flintstones.” This is when a character remains absolutely stock-still, save for one narratively important body part: A jaw moves when the character speaks, an arm moves when the character waves, but nothing else on the character moves at all. Had their creators used full animation to give life to Fred and Barney every week, the poor animators might still be found chained to their desks, ink under every fingernail, while the rest of the world moved on. To see some of the ways in which early film and television animation were technologically similar, watch the film below, directed by Earl Hurd in 1918: Bobby Bumps Puts a Beanery on the Bum. In it you’ll find slash animation, cycling, nearly empty backgrounds, uncomplicated lines and other labor-saving practices. 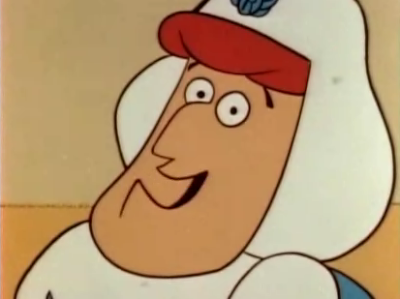 “Roger Ramjet” also pads its brief episodes with lengthy opening and closing credits: sequences that were animated just once but replayed with every single episode. And the show doesn’t even attempt to smooth out figure movements. In an episode I recently watched, a squadron of fighter jets zooms to screen right, only to instantaneously start to zoom downward. It’s a 90-degree turn in a fraction of a second. Much of the best early television animation takes the same tack. Understanding that time and financial pressures would never permit the kind of smooth, graceful movement seen in animated films for more than three decades, TV animators elected instead to cast their lots with cleverness. The shows might not have had the best animation, but they were really, really funny. Pop-culture satire, wordplay of all kinds, highly imaginative voice work and goofy, easy wit were the strength of these shows. Probably the best-known example of this type of program is “The Rocky and Bullwinkle Show,” which is in my opinion one of the greatest works of art of the American 20th century. I am not kidding. 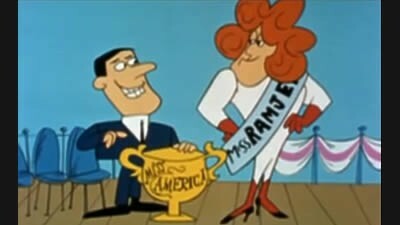 Just as in “Roger Ramjet,” the creators of “Rocky and Bullwinkle” emphasized comedy over animation prowess, and crafted many a joke out of their limitations. “Roger Ramjet” is a scream. It’s a parody of all sorts of dopey superhero comics and shows. It packs more verbal cleverness and satire into one brief episode than is usually found in an entire run of modern sitcoms. What I like best about the show, though, is that each episode also includes a little lesson on animation history.